U.S. Increases Firefighting Aid To Chile As More Than 70 Blazes Rage : The Two-Way At least 13 countries have sent money, equipment and people to help fight wildfires that have killed at least 11 people, including four firefighters. A drone image of a forest near La Florida, Chile, on Sunday, after a wildfire. 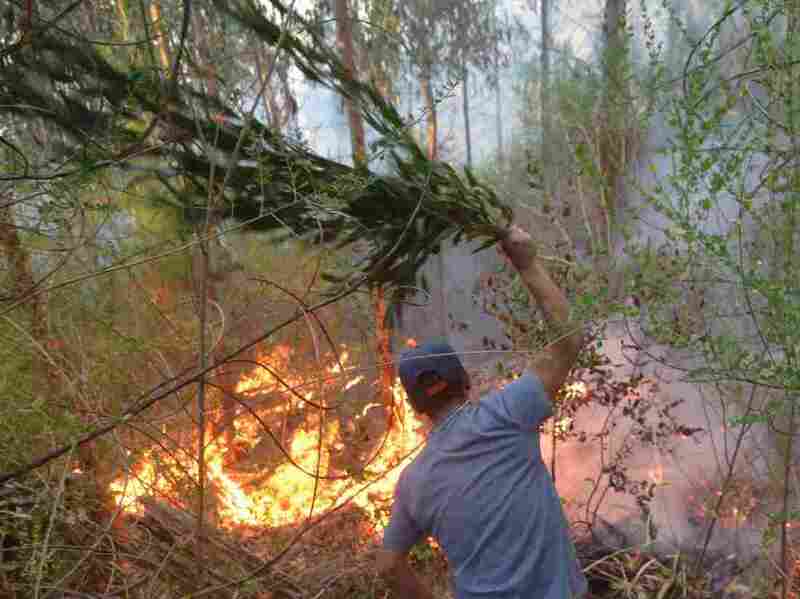 The U.S. Embassy in Chile says it is sending an additional $740,000 for protective equipment and firefighting tools, as the country continues to battle more than 70 active wildfires that have killed at least 11 people in the past two weeks. 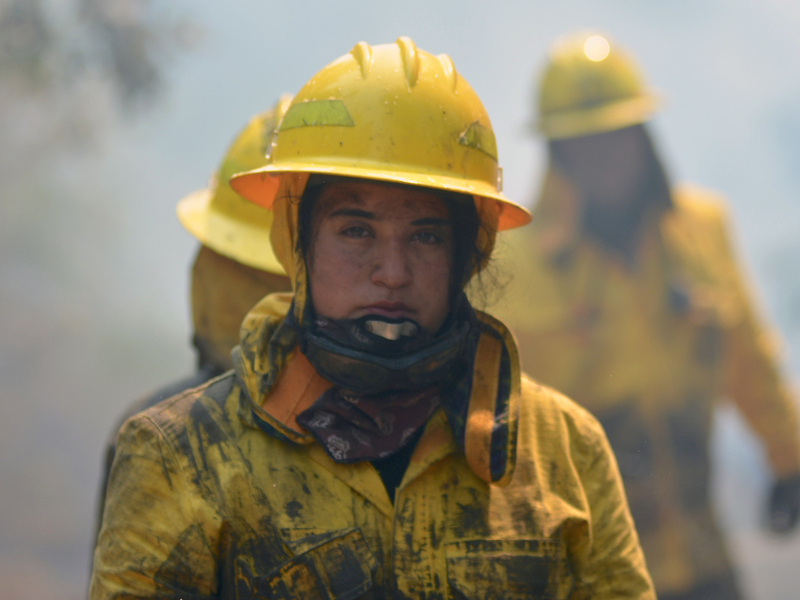 The latest contribution, announced Tuesday, brings the total wildfire aid to Chile from the U.S. government to $840,000, including $100,000 promised last week after Chilean President Michele Bachelet declared a state of emergency. Some of the U.S. funds were used to purchase personal hygiene kits for residents of the town of Santa Olga, on the central coast, which was completely destroyed by a fire last week. "At least one body was recovered from the ashes in Santa Olga, according to Deutsche Welle, and about 6,000 residents fled the city as the flames moved in.
" 'This is an extremely serious situation — of horror, a nightmare without an end,' the mayor of the coastal city of Constitucion told the German broadcaster. 'Everything burned.' "
"We have never seen anything on this scale, never in the history of Chile," Bachelet said last week. "The truth is that the forces are doing everything humanly possible and will continue until they can contain and control the fires." A firefighter working near Concepcion, Chile, where an aircraft assisted teams on the ground working to put out a wildfire. 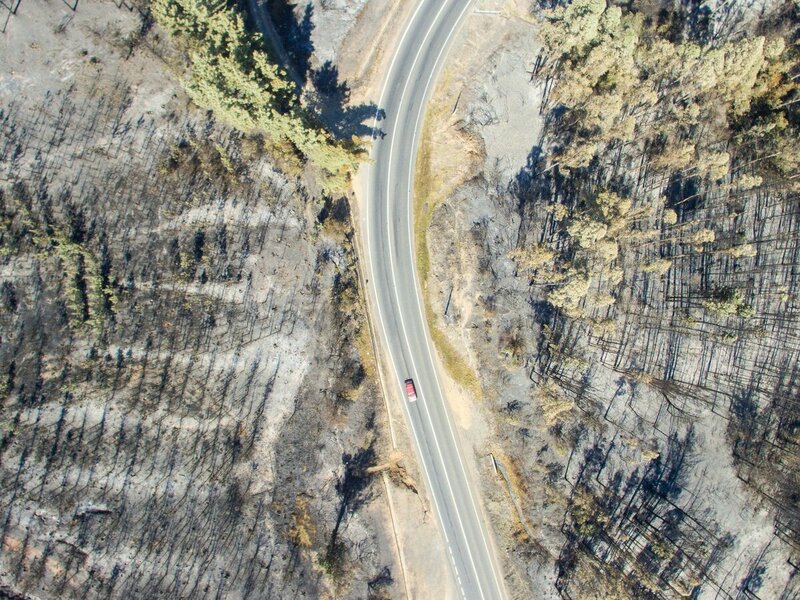 Drone footage published by the BBC over the weekend showed the skeletons of homes caught in the paths of blazes in the central region of Maule. The forest floor appeared white with ash, with only the charred remains of trees. About 20,000 people are currently deployed to fight the blazes, including backcountry and local firefighters, military personnel and volunteers, according to Chile's public safety department. A group of young volunteers from the nearby city of Lirquen, fight a fire in Concepcion, Chile. According to Chile's foreign ministry, at least 13 countries have sent people to help fight the wildfires, which are concentrated in the central and southern part of the country. The U.S. has sent four people, as has Japan. Panama, Russia, Colombia, Brazil, Portugal, Mexico, Peru, Spain, France, Venezuela and Argentina have all sent 20 or more firefighters. Argentina contributed the most manpower, with 130 people on the ground in Chile as of Wednesday. The Brazilian military has contributed a C-130 aircraft to help fight the fires from above. The Russian government also sent an aircraft, according to Chile's public safety department. As The Two-Way reported, a privately owned Boeing 747 "supertanker" plane arrived last week in Santiago from Colorado, paid for by Fundación Viento Sur, which is part of the Walton Family Foundation and run by Ben Walton and his Chilean-native wife, Lucy Ana Walton de Avilés. 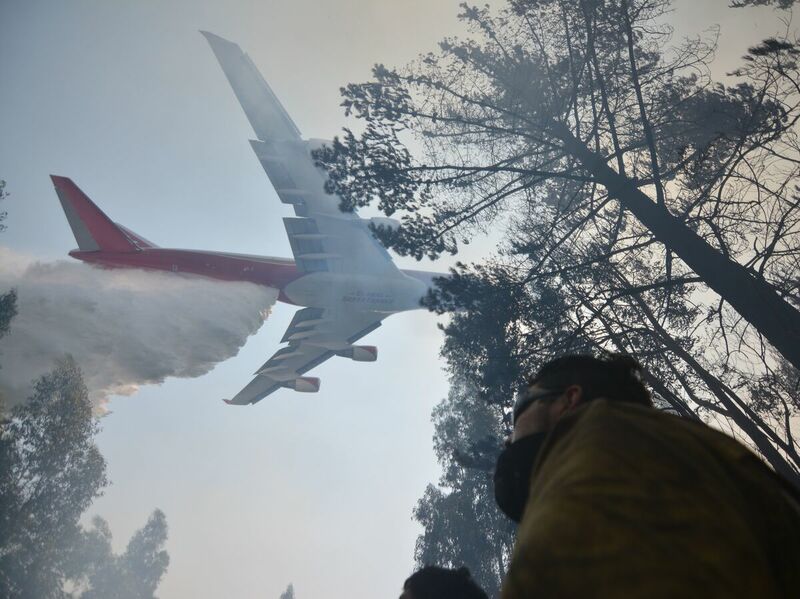 A Boeing 747 firefighting plane helps put out a forest fire in Concepcion, Chile, on Saturday. Earlier this month, NASA released images of the smoke from the fires, which is visible from space. The agency noted that the number of fires has increased in the past two years, going from "roughly 5,200 forest fires per season in the decade between 1990 and 2000, according to a report by the UN Food and Agriculture Organization," to "more than 6,700 fires during the 2015–16 fire season."